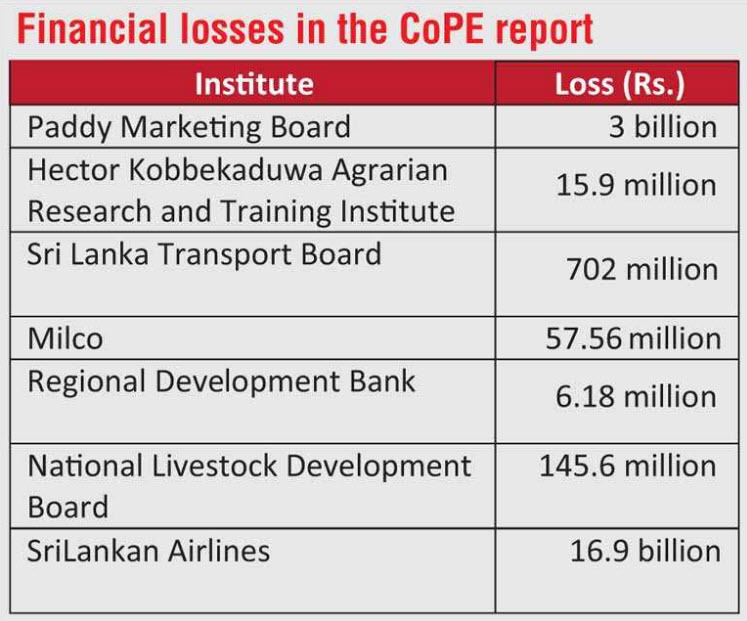 The first report of the Committee on Public Enterprises (COPE) for the period from 1 July – 30 September 2017 was presented yesterday in Parliament, highlighting key issues with SriLankan Airlines and Milco for continuous losses and mismanagement out of 17 State-Owned Enterprises (SOEs) investigated. Moving the report, COPE Chairman and JVP lawmaker Sunil Handunnetti held that COPE and the Committee on Public Accounts (COPA) are responsible to the public and both Committees should act to uphold the trust placed upon them. Proposing to Parliament that the process of allowing media to be present at COPE and COPA sessions should be accelerated, the COPE Chairman held necessary regulations should be amended before the end of the term of current Parliament. “The COPE met last Tuesday to decide on presenting this report, which covers 17 State institutions. Now that Chairman for COPE and COPA are appointed, both Committees should uphold the public trust and act responsibly. Media should be allowed to be part of these proceedings by amending certain sections of the Privileges Act,” he said, proposing to bring in more transparency to State enterprises and their activities. The latest report is the 7th report presented to the 8th Parliament by COPE that signifies the responsibility and exercising of fiscal powers vested in the Parliament. It is important to note the hard work that all members of COPE have put in to investigate 17 State-Owned Enterprises and questionable transactions and operations. According to MP Handunnetti, it is not possible to say that the disclosures made through this report alone will be sufficient to ensure that Parliament or COPE will act against corruption in the country and establish public trust. The direct involvement of the Executive is requested in the COPE report, as only mild interest has been shown by many political leaders to eradicate corruption and reduce waste of public money in the past. The 17 SOEs investigated in this report includes University of Colombo, National Apprenticeship and Industrial Training Authority, Paddy Marketing Board, State Pharmaceuticals Corporation & National Medicines Regulatory Authority, Hector Kobbekaduwa Agrarian Research and Training Institute, Sri Lanka Telecom PLC, Sri Lanka Transport Board and Former Board of Directors, University of Sabaragamuwa, Milco, Sri Lanka Institute of Advanced Technological Education, Regional Development Bank, Sri Lanka State Pharmaceutical Manufacturing Corporation, National Livestock Development Board, SriLankan Airlines Ltd. Road Development Authority, University of Ruhuna, and the University of Kelaniya. During the period in focus, COPE has investigated the financial situation of SriLankan, including the purchase of new aircraft for the company, cancellation of lease agreements, payment of compensation when terminating the agreement, lack of termination clauses in the agreement on A350 aircrafts officers who draw a monthly salary of over Rs. 1 million, and not obtaining Cabinet Approval for the purchase of aircraft. According to Handunnetti, the relevant Ministries, the Cabinet and the President failing to take correct decisions have led the State institution to chaos and large losses. “These State institutions are making billions of losses at a time when estate employees are fighting for a daily wage of Rs. 1,000 and farmers are bearing the brunt of the Fall Armyworm,” he charged. During the inquiry, the SriLankan Airlines Chairman has accepted that the institution has submitted a proposal requesting the Government to grant Rs. 150 million as capital, to avoid further deterioration of the airline. However, the Government has not approved the request. The airline has also explored the possibility of transferring a 49% stake to another company, but this also failed as there were no buyers for the debt-burdened national carrier. It was also revealed in the COPE report that SriLankan Airlines has paid Rs. 16,924.36 million as compensation for cancelling the financial lease agreement of four of the eight Airbus A380 aircraft that were ordered by the previous Government. Cabinet approval for the compensation had not been given prior to making the payment. The initial purchase of the eight aircraft also lacked Cabinet approval. COPE in its report had also drawn attention to 190 employees at SriLankan Airlines drawing a monthly salary of over Rs. 1 million to date. On Milco, COPE has investigated the controversial factory modernisation project, which was entered into with Desmi Institution. COPE report also detailed that the cost involved in Phase One and Two of the Central Expressway was overvalued in the contracts signed by the Road Development Authority (RDA) with the construction companies by Rs. 38.2 billion.